I think even my crusty old Republican Dad (dead now one year at 96) and certainly his even crustier old Socialist Dad, would love this story about people power in their home state. I see us all again, kids marching around the baby grand piano belting out “On Wisconsin” as Dad pounds away. . .
Yep! Don the hats, sing the grannies’ songs, hold on to each other for dear life — and who knows what will happen next! isconsin State Capitol Police Chief David Erwin’s policing is working just about as well as Governor Scott Walker’s job creation policies. Essentially, they’re having the opposite of the intended effect. In the children’s game of “Duck, Duck, Goose,” players sit in a circle. One child designated as “It” walks around the circle, tapping each player on the head and calling out “Duck,” until finally choosing one of the players to be Goose. The Goose jumps up and runs around the circle trying to tag “It” before he can sit in the Goose’s spot. Several participants in the Solidarity Singalong replicated the “Duck, Duck, Goose” idea to turn daily arrests into a fun game. Several pink signs were made with “DUCK” on one side and “GOOSE” on the other. As the capitol police circled the singalong on Monday, August 19, everyone held up their “DUCK” signs. 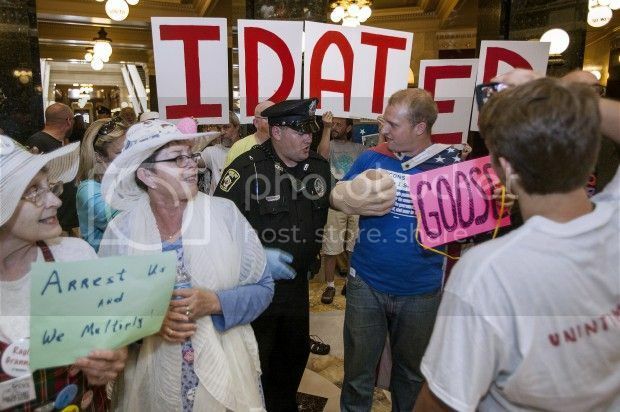 When the capitol police stopped to arrest me, I flipped the sign over to “GOOSE” before I was cuffed and taken away. Instead of arrests angering protesters and prompting them to shout “Shame, shame,” each arrest was a comical moment reminiscent of a child’s game. In recent days, the total number of arrests of participants in the daily Solidarity Singalong haspassed the 250 mark. The singing is an hour-long event that has occurred every weekday in the capitol rotunda since the original 2011 uprising and has gone largely undisturbed with the exception of arrests in the Fall of 2012 and since July 24 of this year. The number of participants has gone from several dozen before July 24 to nearly 500 on August 19. The most recent crackdown has attracted the attention of the national media, from Ed Schultz to Democracy Now. Capitol Police Chief David Erwin was hired just a little over a year ago, and made headlines when he stated that capitol police policy could include hitting protesters if they were determined by an officer to be a threat. This is in stark contrast to the policing of former police chief Charles Tubbs, who was known for his decision not to arrest those who were participating in the overnight occupations of the state capitol. Erwin is back in hot water again after it was found that the Department of Administration moved him to an executive position within the agency for one day, then moved him back to his old job as capitol police chief with an 11% salary hike, paying Erwin, who has only been chief for a year, the same salary that Tubbs was making when he retired. This was obviously done to get around state rules forbidding big double-digit salary increases, which looks awfully hypocritical for a governor who based his platform on the belief that public employees get paid too much. Chief Erwin and Department of Administration secretary Mike Huebsch could not be reached for comment. 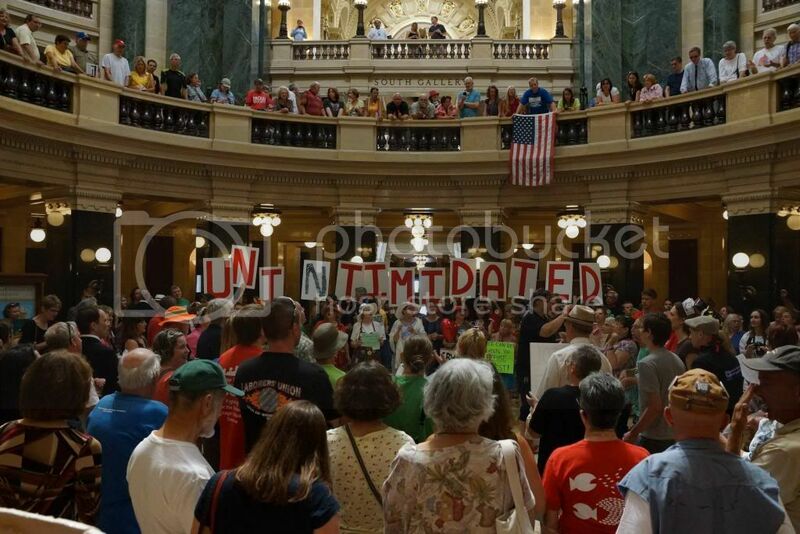 In the previous article I wrote about the Solidarity Singalong arrests, I alluded to two separate court documents – one a preliminary injunction written by a federal judge dismissing the Walker administration’s restrictions on four people to freely assemble without a permit, the other showing that roughly 90% of arrests handed out by Chief Erwin were dismissed in court. I also mentioned that the state is likely to spend hundreds of thousands, if not millions of dollars on prosecuting these cases should they be brought to a trial by jury, as most of the arrestees have requested. The injunction issued by the federal judge didn’t mention the Walker administration’s latest restrictions on free assembly, by which groups larger than 20 are forbidden from assembling without a permit. That ruling is expected to come in the winter, which means that Erwin is actively interpreting the lack of judicial precedent to freely arrest as many Solidarity Singalong participants as he wishes. Some detractors of the Solidarity Singalong argue that singers could simply take out a permit as the new rules call for. They also argue that since the U.S. Capitol requires protesters to take out a permit to protest there, so should Wisconsin. But those detractors forget that not only does the 1st Amendment of the U.S. Constitution say that Congress shall make no law abridging freedoms of speech and assembly, but Article 1, Section 4, of the Wisconsin Constitution says, “The right of the people, peaceably to assemble … shall never be abridged.” Also, unlike the U.S. Capitol, the Wisconsin capitol rotunda was built and dedicated to the people of Wisconsin to be used specifically as a public forum to exercise their rights. Marquette law professor Ed Fallone writes about this in great detail. It could be said that Gov. Scott Walker wants to rid the capitol of the daily protests against his administration before the national media comes to Wisconsin, should he announce a bid for the presidency in 2016, and is ordering his Dept. of Administration and capitol police chief to arrest as many as possible. It could also be surmised that Chief Erwin intends, through unusually high numbers of arrests and placing people in handcuffs for an offense tantamount to jaywalking, to chill dissent. The reason everyone has been arrested – from grannies to teenagers to elected officials, first-time singers, and even mothers with young children – is to warn the public, “Watch out if you come to the capitol, you could be next!” But all that has done is to increase the number of participants in the Solidarity Singalong by tenfold. Erwin’s strategies of chilling dissent aren’t working, just as Walker’s so-called “job creation” proposals are still falling short of the national average.